Small business owners are no longer necessarily limited by geography. Many of them serve customers all over the world. Others know their customers by name because they live in the same town or neighborhood. To pigeon-hole small business owners is about as sensible as doing it with any multi-billion dollar company. One size never fits all. The Holy Grail of starting and operating a business for many may be Google, Facebook or Amazon, but for others of us…it’s more modest. And we’re good with it. Gary Vaynerchuk wants to build the highest building – his metaphor for building his empire. All the best to him. He’s interesting to watch. But there are millions of us – small business owners – out here trying to make a difference in the world in a much smaller way. I don’t think we should make any apologies for that, or feel like we’re losing because of it. Success for some isn’t measured by completing another round of funding. It may not be calculated based on an opening IPO share value. It might be more visceral as a business owner unlocks the doors this morning, flips on the lights and commits himself to another day of operating in a way that brings value to his employees, suppliers and customers. 99.9% of all small business owners will never make the cover of Entrepreneur magazine or Fast Company or Inc. Most are known only in very small circles. VERY small circles. Small doesn’t mean insignificant. I’d argue it means just the opposite. In a world steeped in scope and scale, intimate and personal don’t. Scale or scope. They can’t. Robin Dunbar may have been right. Maybe 150 is the maximum number of people with whom we can maintain a stable relationship. That’s not to say that celebrity business people like Gary Vee don’t impact us, but Gary doesn’t know me. I don’t know him. We can see him online and feel like we know him, but we don’t. Not really. He’s not on my speed dial. I’m not going to call him if I need some feedback. Some of my most powerful moments of service are when I contact a small business owner for the first time. I’ve always viewed my work just like the story of the boy rescuing star fish one at a time. I never feel like a “rescuer,” but I feel more like a friend who wants to help. Sometimes I’m able to help. Sometimes I can’t. Just like any friend. But the conversations are almost always personal and deep filled with vulnerability. That’s a connection you can’t make with strangers. Or one you can make as a fan. 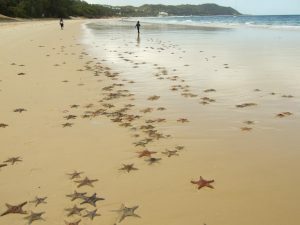 The starfish story holds up when it comes to the impact we have as small business owners. For me, my clients – YOU, small business owner – aren’t starfish incapable of helping yourself. I’m simply empathic to the struggle and glory of operating a small business (and for the umpteenth time, small isn’t based on revenue but in how the business operates). I know how lonely and isolating it can feel. And I know small business owners don’t often have access to the high-end resources available to the CEO of the billion dollar corporation. That’s why I do what I do. It’s why I do it the way I do it. Because I know that I can help make a positive impact on one small business owner at a time. It’s the magic of The Peer Advantage – small groups of small business owners who develop deep connections with one another while serving to help each other build more successful businesses. And at the same time, grow themselves as human beings. For me, that’s among the best work on the planet!